In jazz, the Infant Prodigies become the Youngbloods, Established Heroes, and Elder Statespersons in what seems like sixty-four bars. Tempus fugit rapidly in 4 / 4! Here are two CDs by young fellows — with the gracious assistance of a Senior Sage — that I commend to you. The first features American brothers Peter and Will Anderson; the second UK pals Jamie Brownfield and Liam Byrne. Most often, Will and Pete, superb players, have been found in situations I would call lovingly retrospective — recreating the music of Artie Shaw, Benny Goodman, the Dorsey Brothers, sitting in the reed section of Vince Giordano’s Nighthawks. But they aren’t repeater pencils; their range is both broad and deep. Their latest CD, MUSIC OF THE SOPRANO MASTERS, (Gut String Records), shows how easily and comfortably they move in expansive musical worlds. There is a great deal of swinging brotherly love on this CD (no fraternal head-cutting), and each selection seems like its own small improvised orchestral cosmos. 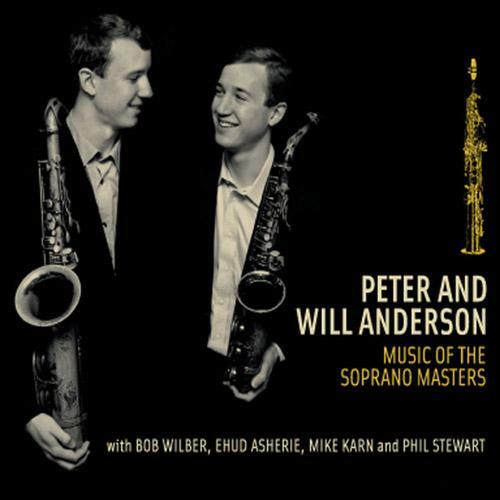 Another delight of this disc is the way in which the Andersons have dug into the repertoire to offer us beauties not so often played, by reedmen not always known as composers — Lucky Thompson, Roland Kirk, and the ever-energetic Bob Wilber, who is represented here by his compositions and his vibrant playing. The rhythm section of Ehud Asherie, Mike Karn, and Phil Stewart couldn’t be nicer or more attentive, and the recorded sound is a treat. Sweetly sculpted liner notes by Robert Levin complete this package . . . a present ready for any occasion. The songs are Home Comin’ (Lucky Thompson) / A Sack Full of Soul (Roland Kirk) / Vampin’ Miss Georgia (Bob Wilber) / Caressable (Thompson) / Jazzdagen Jump (Wilber) / Bechet’s Fantasy (Sidney Bechet) / My Delight (Kirk) / Warm Inside / Haunted Melody (Thompson/Kirk) / Lou’s Blues (Wilber). It’s available in the usual places, but the best way to get it (if you can’t come to the gig) is here. Some months ago, a friend passed along a YouTube video of youthful trumpeter Jamie Brownfield and saxophonist Liam Byrne, and I was delighted. They, too, didn’t exactly copy the past, but they swung mightily in an idiom I would call post-Lestorian with dashes of Tony Fruscella, Harry Edison, George Auld. With the addition of guitarist Andrew Hulme, Nick Blacka, string bass, Marek Dorcik, drums, and Tom Kincaid, a special guest pianist, they sound wonderful — as if the Kansas City Six had time-traveled forward to meet Barney Kessel and Jimmy Rowles in the ether. Their new CD is appropriately called B. B. Q. for the Brownfield // Byrne Quintet, and although they don’t perform the Hot Five classic, there is a good deal of unaffected joyous strutting on this disc. 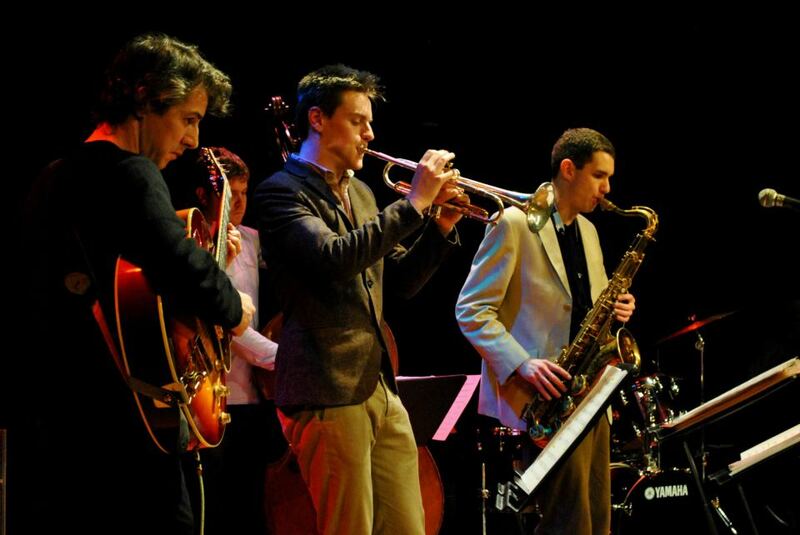 Here is a selection of videos (posted on trumpeter Jamie Brownfield’s blog), and here is the band’s Facebook page. The repertoire on the CD might make it seem to some listeners that the band is looking in the rear-view mirror, but their performances are fresh, personal, and lively — on Wynton’s HAPPY FEET BLUES, Liam’s own IVEY-DIVEY, and a variety of classics, each with its own sweet deep associations: TICKLE-TOE, SINGIN’ THE BLUES, BOUNCE OF THE SUGAR PLUM FAIRY, NOSTALGIA / CASBAH, WEST END BLUES, JOAO, WAY DOWN YONDER IN NEW ORLEANS, 9:20 SPECIAL. Jazz isn’t dead, dear readers; its hair isn’t even graying.